Yves Camdeborde creates wildly delicious (and ridiculously inexpensive) dinners at Le Comptoir, Paris’s hottest reservation. Jane Sigal learns why he’s as passionate about crêpes as he is about haute cuisine. The sky is still inky black at 5 A.M., as Yves Camdeborde arrives at Paris’s Relais Saint-Germain hotel on a silver Go Sport bicycle. With his shiny black hair and long sideburns, the 43-year-old chef looks a little like Elvis Presley, but he sounds pure Béarnais. "I never learned to drive," he explains. At least I think that’s what he says. Camdeborde talks in heavily accented, rapid-fire French. "I’m afraid of cars," he adds. "People are so aggressive." Did I get that right? Is it possible that this fast-talking chef is too timid to get behind the wheel of a car? He’s certainly fearless when it comes to his career. Camdeborde launched an entirely new genre of restaurant in 1992 with Paris’s La Régalade, serving haute food at unprecedentedly low bistro prices and inspiring legions of chefs. Then, in 2005, he bought the small 17th-century hotel Relais Saint-Germain and created Le Comptoir, a 20-seat restaurant that’s now one of the city’s toughest reservations. Le Comptoir is unique. During the day and on weekend nights, it’s a casual brasserie; the kitchen also provides room service for the hotel (which Camdeborde runs with his wife, Claudine) and take-out dishes for the crêperie and food shop Camdeborde opened next door. But on weeknights, Le Comptoir becomes a different sort of restaurant, one that could hold its own against any big-name French chef’s. Everybody in the dining room eats the same five courses from the set prix-fixe menu. The cost for this thrilling meal is 45 euros (about $57)—what you’d expect to pay in Pau, Camdeborde’s hometown, not Paris. Camdeborde describes his food as traditional, regionally accented French cuisine, but that’s just his way of saying he doesn’t have a sous-vide machine or a thermal circulator. In fact, his cooking is often wildly innovative. A lentil soup on his dinner menu, for instance, calls for soft sheep’s-milk cheese straight from the Pyrenees garnished with tiny croutons worthy of Escoffier, but it’s thickened with tapioca, a nearly forgotten housewife’s trick, and served cold with fresh mint. On his lunch menu, he’s more likely to update a classic dish, say, chicken basquaise, stirring Spanish piquillos into the velvety blend of onions, tomatoes and peppers and adding prosciutto-like Jambon de Bayonne just before serving. I’ve been a fan of Camdeborde’s since he opened La Régalade, and I’ve come back to Paris to shadow him for a few days and eat his food around the clock. I want to understand how he thinks and works, and why he’s had such a profound impact on the Parisian food scene that New York City-based superchef Daniel Boulud sent his nephew to train under him as Le Comptoir’s maître d’. Our first meeting requires me to leave one of the Relais’s very comfortable, very large beds at 4:30 in the morning to meet the chef—and his driver—downstairs. Every Tuesday, Camdeborde makes the trip to Rungis, the wholesale food market a half-hour south of Paris. During the drive, Camdeborde tells me that even though he grew up in a food-oriented family—his father, Jean, operated a charcuterie in Pau, and his grandmother Marthe ran a restaurant in nearby Navarrenx—as a teenager he was more interested in becoming a pro rugby player than a cook. His father encouraged him to get work experience in Paris, so the 17-year-old Camdeborde found himself in the kitchen of the Hôtel Ritz in Paris in 1981. Working under Michelin two-star chef Guy Legay and sous-chef Christian Constant, Camdeborde found his calling. He also found Claudine, who was working at a nearby restaurant, Capucine. The two began dreaming of opening a restaurant, so Claudine studied business while Yves trained at Maxim’s, La Marée and La Tour d’Argent before reuniting with Constant at Hôtel de Crillon. At 28, Camdeborde was ready to set out on his own, but he didn’t have much money. He realized he could barely afford to eat at the restaurants where he had trained. So he bought a bistro in the far reaches of the 14th arrondissement and began serving ambitious cuisine at reasonable, then-unheard-of prices. Camdeborde remembers that when star chef Joël Robuchon showed up at La Régalade when it opened, he pronounced that it wouldn’t work. Soon after, the restaurant was perennially booked. People loved the casual service, helping themselves to the pâtés, terrines, sausages and hams made by Camdeborde’s brother Philippe, and eating Camdeborde’s earthy, elegant food—especially game like lièvre à la royale, hare simmered in red wine sauce—while getting change back from a 500-franc note after a dinner for two. 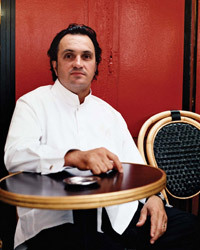 La Régalade’s success inspired Camdeborde’s chef friends, including Thierry Faucher and Thierry Breton, protégés such as Stéphane Jégo, and even his mentor, Constant, to open their own restaurants. I ask Camdeborde why he decided to sell La Régalade after 12 triumphant years. "I wanted to move on before I got lazy," he says. "I needed to discover new things. It’s the same with food and wine: There’s more to eat than lobster, more to drink than Bordeaux." At 5:30 A.M., we arrive at what looks like an airport with lots of hangars; it’s Rungis. Our first stop is the meat-and-tripe pavilion. "What can I sell you, Yves?" asks one of the butchers, smacking him on the back. Oxtails, cows’ heads and pinkish cow tongues dangle in the fluorescently lit space. Camdeborde is a genius at turning odd cuts and organ meats into delicious dishes, braising pigs’ ears with green lentils, turning veal jowls into carpaccio. He picks out beef cheeks, then heads off to look at lamb. It’s cold inside, and there are puddles everywhere from frequent washing. I’m shivering and dragging my wet feet as we move between pavilions: poultry, dairy, fruit and vegetable, specialty foods—it’s the season for foie gras and black truffles. Camdeborde, it turns out, didn’t go to bed until 2:30 the night before. "He’s like a battery, he’s got so much energy," Christian Constant tells me later. By the time we return to the Relais at 9 A.M., I want to go back to bed. But I install myself at a table to get something to eat. Le Comptoir serves a spectacular breakfast (included in the room price for hotel guests): coffee from the nearby La Brûlerie des Gobelins; croissants and pains au chocolat from stellar nearby baker Gérard Mulot; bread from the celebrated Eric Kayser, who has an eponymous chain of shops; yogurt and butter from the Breton dairy Bordier; moist ham cut from a haunch on the counter; aged Comté cheese; coddled eggs; and, to finish, a salad of oranges in orange-flower water. One of the advantages of breakfast—or lunch—at Le Comptoir is that, unlike at dinner, you don’t need a reservation. Also, Camdeborde likes to talk to people in the morning: "At breakfast they’ll tell me what was wrong with dinner or breakfast or the hotel, the little imperfections," he says. I crawl back into bed after breakfast. When I wake up, it’s early afternoon and I’m hungry again. But I’m still feeling sluggish, so I order room service. A dish of pasta shells arrives in a silky artichoke sauce, with slices of smoky chicken breast, cherry tomatoes and snipped chives. Camdeborde has carefully thought out the room service choices, excerpted from the brasserie menu. Everything—salmon croque-monsieur, beef stew, crème brûlée—can be eaten with a fork or spoon in front of the TV. If you’re eating in, he figures, you don’t want something complicated. At 7 P.M., the staff at Le Comptoir starts laying the tables for dinner. They unwrap a dozen cheeses and arrange them on platters and set out small baskets of vegetable chips—beet, carrot and Jerusalem artichoke—for guests to nibble with a glass of the licorice-flavored, once-banned absinthe. Camdeborde is already in the dining room dressed in a white tunic and black pants. He runs to the door to greet people, usually only to turn them away, because the restaurant is always full, but also to offer directions to or advice about nearby restaurants. At 8:30 guests start arriving. I discover that the two French couples seated next to me made their reservations seven months ago. One of the men is deciding what to drink. I offer him a taste of my wine, the 2005 Arbois Pupillin Trousseau from Philippe Bornard. Camdeborde is a ferocious champion of small French growers like Pierre Breton in the Loire and Marcel Lapierre in Beaujolais, and Le Comptoir’s wine list is packed with such bottles. The first course is soup. The waiter sets down a bowl in front of me, with thin slices of raw scallops arranged like rose petals in the bottom, scattered with a fine julienne of chorizo. He pours a steaming puree of celery root and chestnuts into my bowl, which barely cooks the scallops, then adds crunchy toasts on top. While Camdeborde claims to do traditional French cooking, this dish is clearly modern with its contrasts in texture and temperature, not to mention the spicy Spanish chorizo. The roasted saddle of lamb, served pink and sliced off the bone, comes with cèpe mushrooms sautéed in walnut oil with shallots and chives. Camdeborde’s cheese platters are some of the best examples of his generosity. Four sculpturelike metal trays designed by the artist Renaud Vassas, Camdeborde’s friend, circulate in the room; they’re loaded with French cheeses, including Epoisses, Camdeborde’s favorite, aged perfectly by the Parisian affineur Jacques Vernier at Fromagerie Boursault. For dessert, Camdeborde has made a creamy confection with the season’s first candied chestnuts, folded into whipped cream and dusted with bitter cocoa. Next come artisanal chocolates by Jacques Genin, including one with a remarkable mint flavor. My neighbors are convinced their meal was worth the wait. Camdeborde and I meet the next day at a reasonable 9 a.m. to visit a few of his suppliers. "I need the human contact," he says. "Otherwise it’s just cook, cook, cook." After a few stops we find ourselves planted around a wine barrel at Caves Augé, a famous old wine shop, drinking Billecart-Salmon Champagne with owner Marc Sibard. Camdeborde talks about how important his chef friends are in his life. Before the New York City Marathon in November, his posse ran together four or five times a week. Rugby and his Sunday pelote basque games (sort of like squash) are sacred. "You know, 80 percent of chefs divorce," he tells me. "There’s a tremendous personal cost." It’s hard to take notes and look Camdeborde in the eye at the same time, so he keeps touching my forearm to get my attention. He wants me to understand what he is saying, not write it down. "Without my wife," he says, "I wouldn’t do anything." We’ve been talking so long we haven’t noticed lunch service at the brasserie must have started. Claudine and I share a table while Yves goes down to the kitchen. At lunch there’s an actual menu with choices. I could have a simple boiled egg with mayonnaise or a foie gras terrine, or one of Camdeborde’s earthy dishes with tripe or pig’s foot. I order the special written on the mirror on the wall, a kind of shepherd’s pie made with tender beef cheeks. Instead of the usual mashed-potato topping, he’s mixed in celery root. As I dig in, Camdeborde keeps coming over and kissing Claudine on the head, on the lips. Claudine is attempting to eat a salad of cherry tomatoes, carrots, haricots verts and sucrine, a kind of baby romaine, with a fiery dressing of red wine vinegar, olive oil and hazelnut oil emulsified with a spice paste instead of mustard. A few days later, I return to Camdeborde’s crêperie, take-out spot and specialty-food store for a final taste of his cooking: thin slices of roasted veal, arugula and shaved Parmesan melting from the heat of the just-made buckwheat crêpe griddled right in front of me. Trailing Camdeborde, I’ve seen how compelling it is to follow an incredibly talented chef who insists on making his cooking available to everybody—whether in a five-course meal or a take-out dish. I know that even if I reserve now, it will be months before I can have another dinner at Le Comptoir, so before leaving Paris I stock up on some of the ingredients I’ve tasted in his cooking: piquillo peppers for his chicken basquaise, green lentils and tapioca for soup. They will have to hold me until my next dinner here, in the spring. Le Comptoir, 9 Carrefour de l’Odéon, 6th Arr., Paris; 011-33-1-43-29-12-05. Jane Sigal, an F&W contributing editor, is a freelance writer based in New York and a Francophile extraordinaire.